Conservative Democrat, ally of Sam Rayburn, chose not to continue serving as Vice President (he famously considered the office "not worth a bucket of warm piss") over his anger at Franklin D. Roosevelt's choice to seek a third term. He also opposed the President's attempts to pack the U.S. Supreme Court. 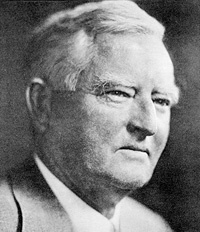 Garner ran against Roosevelt in 1940, but lost the nomination.